What an exhilarating first year representing you on the Encinitas City Council! Elected office is a highly engaged vocation. It’s much different from my law practice, with its long hours of solitary mental work. Policy making involves the rapid exchange of ideas, lots of meetings and the emotional roller coaster — from a spike of anger about something that seems unreasonable, to the positive surge of accomplishment from achieving a long-sought goal. I love this work, even though at times it’s so consuming that it’s hard to disengage. Some of the year’s most satisfying moments came while working with my colleagues. 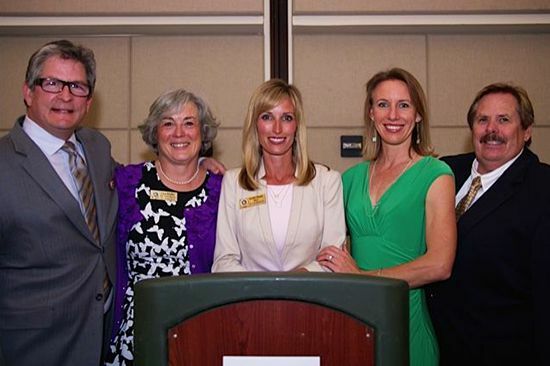 The Encinitas City Council — (l. to r.) Council Member Tony Kranz, Deputy Mayor Lisa Shaffer, Mayor Kristin Gaspar, me, and Council Member Mark Muir. I consistently admire Mayor Kristin Gaspar’s ability to run an upbeat, positive and efficient City Council meeting. She is a very skilled facilitator, masterfully and gracefully managing the public, staff, and council members for hours at a time. I enjoyed negotiating the new city manager’s employment package and the lease of city land to the Intrepid Theatre Company with her. Council Member Tony Kranz and I successfully accomplished the creation of a mediation ordinance, and we continue to collaborate closely on the proposed urban agriculture ordinance. Tony’s insights and out-of-the-box thinking to create workable and creative solutions are real assets to the Council. I thoroughly enjoyed serving with Council Member Mark Muir on the wastewater board and as part of a water rate subcommittee, and admired the depth of Mark’s knowledge during labor negotiations. His insights were instructive and charted our course. Deputy Mayor Lisa Shaffer’s fully formed and well-articulated world view continues to inspire me. I worked with her on a new organics recycling law, consult with her on rail trail issues, and we collaborated on how to support public safety in a fiscally responsible way. She masterfully navigates organizational hierarchies with great clarity, and her perspective often provides a strong baseline for discussion on some very complex issues facing the Council. I don’t feel the extreme polarization in Encinitas politics that many see on the national scene. We don’t always agree, but I think we reach a consensus 90% of the time. When there is disagreement, for the most part it’s respectful. Small kindnesses are often extended in multiple directions, and decisions to take the high road are made when other routes may appear tempting. It’s a tricky dance, balancing the heat of political disagreement with the human connection. Encinitas is undeniably prosperous. According to the County Recorder, we have one of the highest assessed land values of the 18 cities in the county. Our residential land is worth $12 billion (yes, billion with a B!) and our commercial land is worth $1.4 billion. At the city government conferences I attended last year, I learned of the problems plaguing other cities, problems that we’re blessed not to struggle with — blight, high crime, endemic poverty and homelessness, business stagnation or decline, and crippling debt. Even the City of San Diego is considering floating a bond in 2016 to repair its basic infrastructure, such as paving roads. Here in Encinitas, we pave our roads, and replace our aging infrastructure within our budget. I’m grateful to past city leaders for putting us on this strong financial path. I know that we’re all committed to keeping us here. One of the year’s highlights was the opening of the 44-acre Encinitas Community Park, an ideal blend of a community and sports park. Hundreds of families use this park every week, from the innovative playground equipment to the skate park, meandering dry creek that integrates the wildly popular dog park, picnic tables and walking and running paths and the soccer and baseball fields. The $40 million (gulp!) cost of purchasing the land in 2001, dealing with contaminated soil, years of litigation and delays, finally resulted in the opening of this popular community gem. 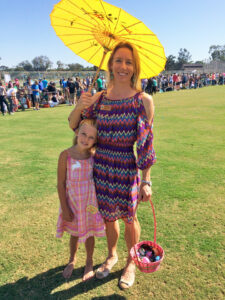 I was honored to announce the city’s spring egg hunt (at right). The ability and interest of private local company Dudek, together with support from the downtown Encinitas Mainstreet Association, to put together the technical documents necessary to designate our 88-year-old La Paloma Theater as an historic building. Dudek and its community-minded employees deserve a major acknowledgment for donating their considerable expertise when historic movie theaters across the country are being bulldozed. The birth of Friends of the Cardiff Rail Trail, a group of dedicated volunteers supporting the effort to improve the rail corridor through better biking and walking infrastructure. It’s such a gift when previously uninvolved people throw themselves into support of a community improvement project. Many groups support worthy causes throughout our city that make our community great. This one emerged fully formed, with considerable organizational muscle. 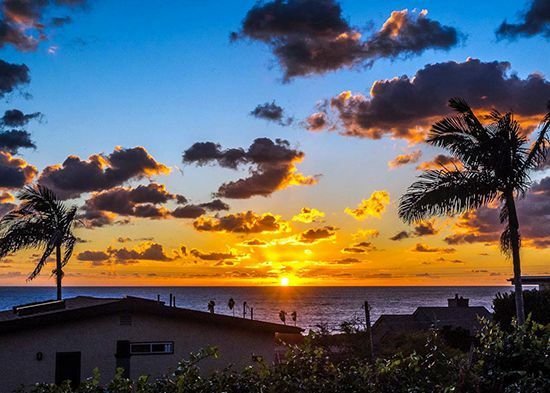 This year, the City of Encinitas continued our environmental commitment. We established the first organically managed park at Glen Park in Cardiff, and piloted a fruit tree orchard there. Our city’s first community garden grew roots after a six year delay thanks to a dedicated volunteer group. We eliminated using the poisons glyphosates and neonicotinoids in all city operations, and continued with our improvement of city streets, creating a walking path to the beach on La Costa Ave., nearly finishing the sidewalk and utility undergrounding project on Santa Fe Drive, and doing road improvements around Paul Ecke Elementary School. We’re also updating our climate action plan. 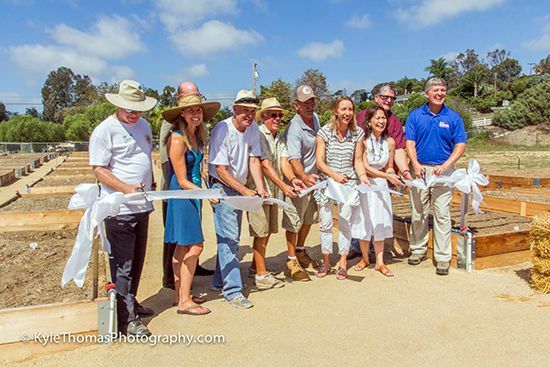 Ribbon cutting at Encinitas’ first community garden. We’re a great city that can be even better by giving a bit of polish to areas that could use some shine, such as the streets and sidewalks in downtown Leucadia and around many of our schools. Because of low oil prices, it’s the right time to pave more streets and we appear poised to put additional money into eliminating all of our “failing” streets this year. This year, I hope we can finalize an agriculture permit that will reduce costs and red tape for those growing, tending, harvesting and selling local food in our city, as well as loosen restrictions on having bee hives. We need a more dedicated focus on our city’s urban forest to protect the city’s tree canopy. We need to engage the business community along the El Camino Real corridor in an active conversation about improvements. (Please write me with your ideas!) One of the biggest issues in the coming year will be getting the city compliant with state law by passing a housing element. Our IT department is streamlining the process of getting permits online; the city clerk has made the city code searchable; we have waived fees for greywater systems and solar panels, and established a mediation program. These streamlining improvements will continue with an updated city website. I relish this job that you have entrusted me with, and I’m very optimistic about our future. I was honored to serve as your Deputy Mayor last year. Public policy work is important, and I feel grateful to be doing it. The interchange of ideas and the process by which decisions get made fascinates me. I’m committed to the residents of this city – to hear you, represent you and move our city forward with your valuable input. In two months, I’m excited to be turning 40. I feel young enough to be flexible and energetic, and old enough to have learned from personal and professional experiences and to recognize the wisdom offered by others. Last year, my enthusiasm for public service and increasing interest in our American governmental system inspired our family to travel to Washington, D.C., where we explored the heart of our democracy. 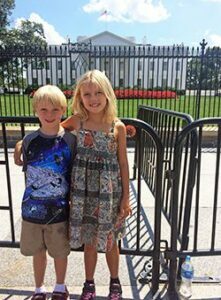 Ava and Oliver outside the White House in Washington D.C. this summer. I read a number of political and historical books, the highlight being The Bully Pulpit: Theodore Roosevelt and William Howard Taft, and the Golden Age of Journalism by Doris Kearns Goodwin. A prodigious writer (see quotes below), Roosevelt assumed the presidency at age 42 in 1901. I often reflect on Roosevelt’s optimism and ability to effect true change through oratory. His “deep seated disgust with physical and moral slackness” even inspired my parenting this year, as I read a long description of his childhood to our 7-and 8-year-olds and have incorporated some of his habits into our family routines. I believe Encinitas is on the right track for 2016. Now that we’ve hired a strong city manager, we can progress more quickly on projects in the pipeline, while continuing our commitment to transparency, responsiveness and overall prosperity in the city. Here’s a raised glass to where we’ve been in 2015 and to where we’re headed in 2016!